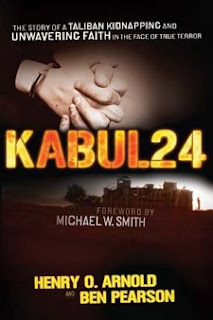 I was immediately engrossed in the book Kabul 24. It is a powerful story of eight Western aid workers and 16 Afghan workers associated with the organization “Shelter Now International” who were arrested for allegedly proselytizing Afghanis during the late months of the Taliban regime. Not all of the members of the Shelter Now team in Afghanistan were arrested. As the crackdown began, some family members and other workers made a break for the Pakistan border. As you follow them on their harrowing escape through Taliban territory, you’ll be sucked into the desperation they felt and then be uplifted by the sincere hope they had that God would take care of them. As you read the story of those who were captured by the Taliban, you begin to get a sense of how powerful God is. Through persecution, mock trials, and horrid prison conditions, you’ll see a group of believers whose faith never wavered even if emotions did. They expected God to make an entrance, and He did. God’s timing is everything, and I’m glad the writers conveyed that. God provided exactly what the Kabul 24 team needed via Afghani sympathizers and even the Taliban itself at times. Almost as if to mock the persecutors, God used their own people to provide for the Westerners and the Afghani workers. And the US Army Special Forces team at the end is a powerful example as well for those who need more evidence. For anyone who has ever wondered about real-world persecution of the saints, or anyone who wants to see an adventure of almost Biblical proportions, this is the book for you. More than that, however, it is a book of God coming through for desperate people who had no where else to turn. You can visit the Shelter Now International Website and read about current projects, but you won’t see anything on there about the detention in Taliban Afghanistan. I, for one, respect that. I also found the Red Cross report on their visit with the group in the fall of 2001, just before the 9/11 attacks in New York. It was interesting to read the Red Cross report after having read about it in the book. Look, do yourself a favor and get your hands on this book. It will rock your world.